Originally from Wasauksing First Nation near Parry Sound, Waubgeshig Rice is a natural storyteller. Since June 25, Rice has been in the host chair of CBC Radio’s Up North program from 4 to 6 pm weekdays. Following an extensive search, when it was announced Rice had won the race, there was a sigh of relief. He comes with a long list of accomplishments in radio, television and print journalism. 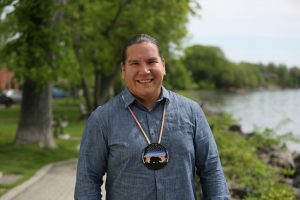 He is the first Indigenous host of a CBC Radio Ontario program. Up North is broadcast throughout Northern Ontario. Waubgeshig, whose name means “the colour of the sky at dawn before the sun comes up” is more like the rising sun. He’s bright, engaging, personable – yet, thankfully, shines with humility. But Rice doesn’t shy away from topics and stories he knows little about. Bring it on. He’s ready. Originally from Wasauksing First Nation near Parry Sound, Rice is a natural storyteller. In fact, he has two published books, Legacy and Midnight Sweatlodge with a third, Moon of the Crusted Snow, being published this fall. He is a featured author at the three-day Wordstock Sudbury Literary Festival this November. “It was always the bigger dream when I was growing up to be an author. As a kid, I read lots, probably much more than my peers…science fiction, fantasy and the classics. But there were no Indigenous authors I was exposed to. I had no idea I could be a writer. After graduation, he worked as a copy editor for the Canadian Studies Department at the University of Akron in Ohio, and had internships with CBC and The Weather Network. For four years, Rice filed local and national stories. In 2010, he produced radio and television documentaries in Toronto and Ottawa. In 2014, he was honoured with the Anishinabek Nation’s Debwewin Citation for Excellence in First Nation Storytelling. His 1980s dreams were coming true as his talents began being recognized far and wide. Hosting is a different animal and CBC provided a rich training experience. Radio personalities Rice sets on a pedestal include: Duncan McCue, Indigenous host of CBC Radio’s Cross Country Checkup; Piya Chattopadhyay, award-winning host of Out in the Open; and Matt Galloway, host of Toronto’s Metro Morning. Each has inspired him in different ways. How’s Rice performing as he begins his new career? “I asked listeners to let me know anything about how I’m doing and what I should change. I have a thick skin and could take whatever they said. Well…they were very generous and it was all positive, nice comments.” A shy smile of relief crosses his face.